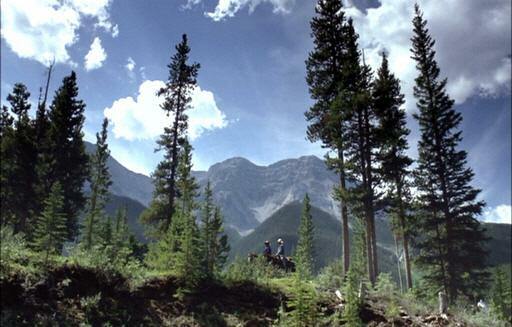 The Riding Ridge is near the northern end of Spray Valley Provincial Park, off Hwy 742, 9.4 km south of the Three Sisters Drive intersection in Canmore, and 26.1 km north of Mule Hill (Rummel Creek). The site is to the west. Annie Proulx was quite specific in her story; Ennis and Jack never returned to Brokeback. That experience, that memory, far more precious than any other, was too special for them to risk disturbing. Perhaps by accident, or possibly by design, the filmmakers brought the men back some 12 years later to the Brokeback location where young Ennis had gone to meet the Basque and order soup. Their lives now, far more complicated, far less blissful. Brokeback Mountain - Story to Screenplay by Annie Proulx, Larry McMurtry and Diana Ossana (Scribner) ISBN-13: 978-0-7432-9416-4, page 17.